Prayer is talking with God. We pray because the world needs God and so do we. We pray together as a community when we are gathered on Sundays and as Little Church communities, not to mention being scattered as individuals or as families. He is listening - whatever we ask, think or imagine, God is able to do immeasurably more. The key however is listening to God and knowing what He is saying to us. With this in mind we are committed to helping each other discover a personal life of prayer – one that also involves a daily pattern of worship and scripture. 1 Worship: Sing songs, read psalms, dance like no-one’s watching. Speak out praise, write your own ‘psalms’, shout for joy. Step outside, revel in the creation you find yourself in. 2 Bible: Catch up on your Bible in One Year, asking yourself: What does this passage tell me about God? What does this passage tell me about us? 3 Prayer: Pray for your knots, invite the Holy Spirit into your day. Pray for our Little Churches dotted around the city and for Bristol itself to see the transformation that comes from Jesus. Pray for the world; for those affected by natural disasters, war, famine and terrorism. Pray for God’s Kingdom to come. 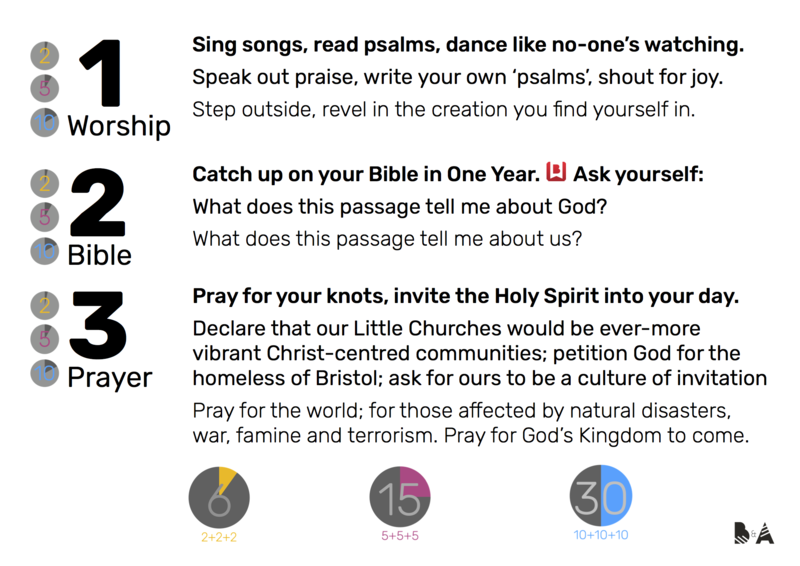 We’d love to encourage you to join in with the prayer life here – everyone is welcome to get involved. On Monday through to Thursday at 9.15am-9.45am we pray at B&A Gloucester Road. Each day has a different emphasis. On Mondays we give thanks and pray for the week ahead. On Tuesday we worship God and pray for one another. On Wednesday we pray for our Little Churches and on Thursday we pray for our Sunday Gatherings. Available at Sunday Gatherings and from the Church Office, these simple A6 cards give easy to follow steps on how to spend time with God and live a life of prayer. Download it here.